Evo Stik action from Peterborough Sports' v Kidsgrove Athletic last weekend. Sports won 3-0. Peterborough Sports travel to Eynesbury for an attractive preliminary round FA Cup tie tomorrow (August 19). Sports are the reigning United Counties Premier Division champions and Eynesbury are tipped by many to succeed them. Holbeach United will expect to make progress as they entertain fellow United Counties Premier Division side ON Chenecks. The Tigers beat ONs 3-0 in a league game at Carter’s Park last weekend. Holbeach are the pace in the Premier Division with seven points from their first three matches. Deeping Rangers are at higher level Barton Rovers in the FA Cup tomorrow, while Yaxley host fellow UCl Premier Division side Harborough. The Cuckoos could be without eight senior players. 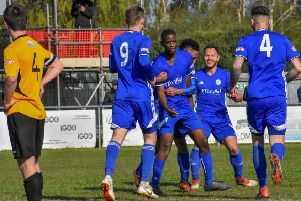 Stamford and Spalding switch their attentions to mouth-watering FA Cup ties after making excellent starts to their EVO Stik Northern League campaigns. Stamford are at higher-level Cambridge City tonight (August 18), while Spalding travel to United Counties Premier Division side Wisbech Town on Saturday. Peterborough Northern Star, Blackstones, Pinchbeck United and Bourne are all in league action tomorrow. Pinchbeck are top of UCL Division One with Blackstones in second. Preliminary Round: Cambridge City v Stamford. Preliminary Round: Eynesbury Rovers v Peterborough Sports, Wisbech Town v Spalding United, Barton Rovers v Deeping Rangers, Holbeach United v Northampton ON Chenecks, Yaxley v Harborough. Premier Division: Northampton Sileby Rangers v Peterborough Northern Star. Division One: Blackstones v Thrapston Town, Bourne Town v Burton Park Wanderers, Buckingham Town v Pinchbeck United, Oakham United v Huntingdon Town. Division One: Leiston Res v Wisbech St Mary, March Town United v Debenham.